On "Peace & Reconciliation of Korean Peninsula"
Lee Sang-ki (seventh from left), president of the Journalists Association of Korea (JAK) and the Asian Journalists Association (AJA), poses with IFJ President Christopher Warren (seventh from right) and other members of the Executive Committee of the International Federation of Journalists (IFJ at the main office of the Media, Entertainment and Arts Alliance in Sydney, Australia on Dec. 3, 2005. A special international conference of journalists will be held at Mt. Geumgang, North Korea, in February 2007. Under the theme "Peace and Reconciliation of the Korean Peninsula," the special conference will be co-sponsored by the International Federation of Journalists (IFJ) and the Journalists Association of Korea (JAK) along with as the Asian Journalists Association (AJA). As proposed by the JAK, the IFJ Executive Committee unanimously approved the Mt. Geumgang conference during its meeting on Dec. 2 and 3 in Sydney, Australia. The Executive Committee confirmed that the dates of the special conference will be in late 2006 or early 2007, with the exact dates and scope of participants to be decided after consultations among the IFJ, the JAK, and the AJA. 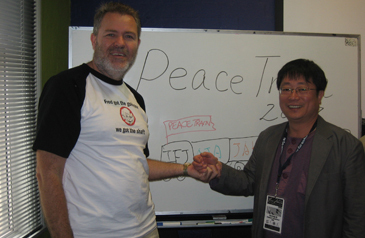 IFJ President Christopher Warren (left) poses with Lee Sang-ki, president of the Journalists Association of Korea and the Asian Journalists Association. On the sidelines of the Executive Committee meeting, Lee Sang-ki, president of the JAK and the AJA, met with Australian Christopher Warren, president of the IFJ, and Belgian Aidan White, secretary general of the IFJ, and agreed that "the JAK, AJA, and IFJ will jointly organize the special international conference of journalists at Mt. Geumgang in February 2007." The two sides also agreed to invite all IFJ Executive Committee members, numbering about 20, and journalists from AJA member countries, along with journalists belonging to the IFJ to the special conference. The IFJ, the world's largest organization of journalists with a membership of around 500,000 in more than 100 countries, was first established in 1926 and was relaunched in 1946 and again in its present form in 1952. 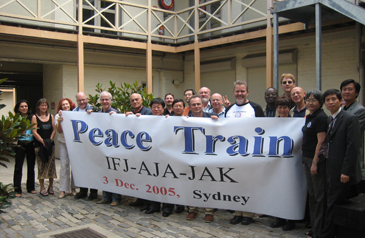 The JAK, which became a full member of the IFJ in 1966, hosted the 24th IFJ World Congress in Seoul in June 2001. The AJA was launched as the first Asia-wide regional journalist organization in 2004 during the 2004 East Asia Journalists Forum organized by the JAK. 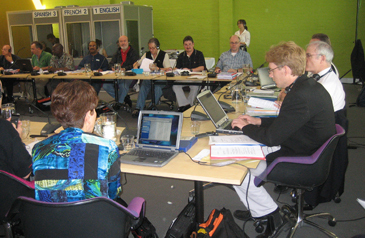 The IFJ Executive Committee meeting is in session at the conference room of the main office of the Media, Entertainment and Arts Alliance in Sydney, Australia, on Dec. 2, 2005. The Executive Committee unanimously approved a Korean delegation's proposal for a special international conference of journalists at Mt. Geumgang in February 2007. The IFJ holds its world congress every three years and two Executive Committee meetings a year, along with regional meetings. IFJ President Warren said the Mt. Geumgang special conference would mark the first of its kind in its history. "It reflects the growing importance of the role and concern of global journalists on the peace and reunification of the Korean Peninsula." Shortly after the IFJ Executive Committee meeting on Dec. 3, IFJ Secretary General White delivered a letter to JAK President Lee, confirming the IFJ Executive Committee's support for the special Mt. Geumgang conference. In the letter, Aidan said, "The Executive Committee welcomed the presentation of the Journalists Association of Korea and the Asian Journalists Association on the proposal to organize a major international event in late 2006 or early 2007 to highlight the role of free media and independent journalism in the struggle for peace and reconciliation on the peninsula of Korea." 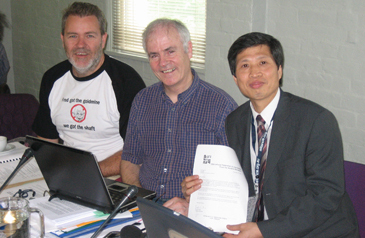 Kang Seok-jae (first from right), vice president of the Asian Journalists Association, poses with IFJ President Christopher Warren (first from left) and IFJ Secretary General Aidan White with an IFJ letter confirming the IFJ's co-sponsorship of a special international conference of journalists at Mt. Geumgang on display during a break of the IFJ Executive Committee meeting at the conference room of the main office of the Media, Entertainment and Arts Alliance in Sydney, Australia on Dec. 3, 2005. "On behalf of the IFJ, I am pleased to confirm that we will fully support your proposal and will work with you to ensure the success of an international event in this area," Aidan said in the letter. "We congratulate you on the work you have carried out so far and wish you well in the development and implementation of the project and assure you of our full cooperation." Accordingly, leaders of the IFJ and JAK plan to visit Pyongyang, the capital of North Korea, in June 2006 to talk with North Korean journalists about the Mt. Geumgang special conference. At the Pyongyang meeting, IFJ leaders, including Warren and Aidan, are expected to ask for North Korean journalists' participation in the 4th Asia Journalists Forum slated for October 2006 in Seoul. The forum is organized by the JAK and AJA. On Dec. 1, Lee and two other Korean delegates, including Kang Seok-jae, vice president of the AJA, made a presentation on the Mt. Geumgang conference titled "Peace Train" before a six-member IFJ Administrative Committee, which is composed of core IFJ leaders. Ivan Lim from Singapore, vice president of the AJA, joined the Korean delegation for the presentation. In the presentation, the Korean delegates called for "the IFJ's great interest in and concern about North Korea for the peace and prosperity on the Korean Peninsula," calling it a "historic mission for the IFJ to take the initiative in promoting press freedom and world peace together with North Korea and North Korean journalists." The Korean delegation also said "the ongoing six-party talks on the North Korean nuclear issue will ultimately contribute to world peace and the IFJ-initiated Mt. Geumgang event bears a great significance in promoting press freedom in Asia-Pacific countries such as Nepal, the Philippines and Sri Lanka." On the Mt. Geumgang conference, Lee said, "A pan-governmental support and assistance along with a general understanding of the Korean society is necessary for a successful conference at Mt. Geumgang. "I hope all Korean journalist circles become one to give their full support for the special conference."